Sometimes bad luck turns into good luck. This little gem found its way to the garage last night. Thanks for the hookup Hondarider77. Oh yes, we are in the market for the various parts. Subscribed!!!! Curious what you will make with it! the forks I cut and put on my crf100....the kx was tim's old track bike he used down at GSS... he sold it to the lady who took pics back then, I got it from her when she moved to Austin. 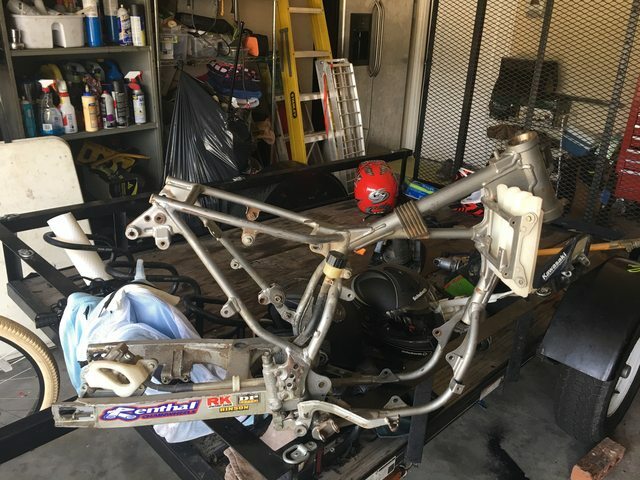 Is the KX85 frame same as 65? as said, no it is bigger. both the 85 and the 65 would be hard to fit a fourstroke motor into. several folks have taken the honda 85 2 stroke and put the kitted crf 100 motor in. One company even produced a mod kit to do it with. I bought a honda 85 thinking I would do that with it, it still sits in my shop. There were two that used to run TMGP not sure if it they still are or not. Those two stroke cylinders are short. There is a TMGP father and son team who have Honda engines in their KX-65’s. Sweet Jeeezus, the more we research the less appetite I have for all the fab work. The Miller family just might have to do something we have been against. I always said no to two strokes, but that is the only thing that makes economical sense for this build. A co-worker of mine here at Cycle Shack has an '08 KX 65 he is parting out. Everything is there except for the front end. The rest is all there. I think he only wants $200 for the rest of it if your interested. Good luck with the build. The motor would need to be rebuilt. it's tired. I think I have an expansion chamber and maybe a pipe for a kx65. Maybe a carb. If bucknut doesnt get it, I'll take it... looking for a spare motor to build. I liked you better when you were a Grom enthusiast!!! Tim is expecting your call and said you can pick it up tonight if you like. Sorry, it get's busy around here and takes me a few minutes to respond.